This is a review of a recent trade we placed on in our nightly report The Wagner Daily. 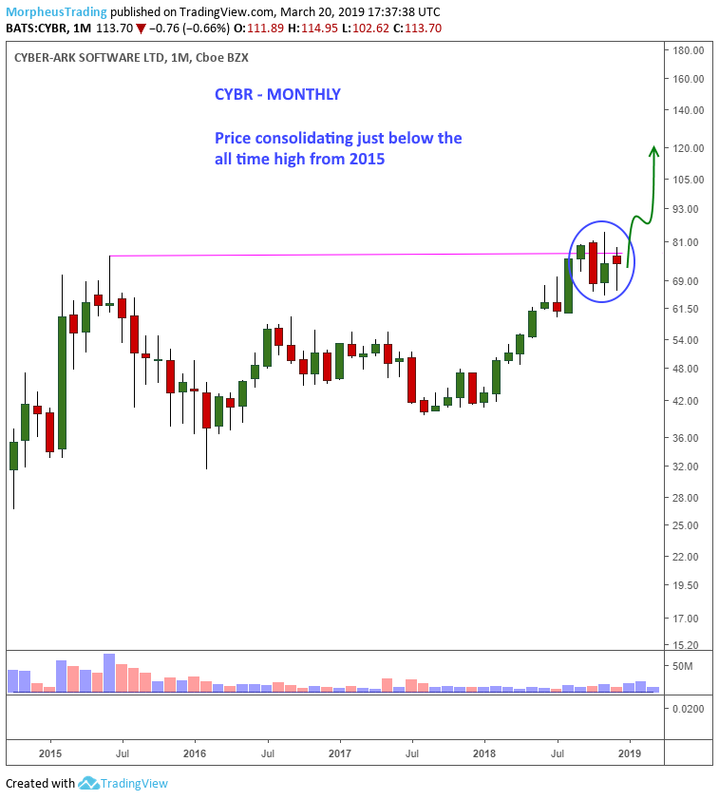 The stock we purchased is Cyberark Software ($CYBR), which we remain long with an unrealized gain of 43% from an entry on January 18. Before we get into why we bought $CYBR when we did, let’s talk about how it made our watch-list in the first place. Our trading system is based on weekly charts, as we look for stocks that may be ready to breakout following a few months of basing action. We prefer to buy stocks that have strong quarterly earnings and revenue growth and hold these stocks for gains of 25-50% or more when market conditions are ideal. Sometimes we may buy stocks that are showing an exceptional amount of strength but lack earnings or revenue growth, but these stocks are typically held for a shorter term pop of 15-20%. The daily chart of $CYBR first caught our attention in early January by setting higher lows within a basing pattern during a market correction, when all broad market averages were setting lower lows. At that time, most small and midcap growth stocks had corrected 40-50% off highs but $CYBR pulled back less than 25% (sign of strength). The monthly chart was the icing on the cake though, as the price action was consolidating just below all time highs. A breakout from the current base would lead to a new all-time high, with no resistance above. Aside from the technical action, $CYBR has produced two quarters in a row of impressive earnings and sales growth at +71% and +92% (eps) and +35% and +31% (sales). On the close of January 4, our market timing model went on a buy signal, alerting us to begin to put money to work on the long side. 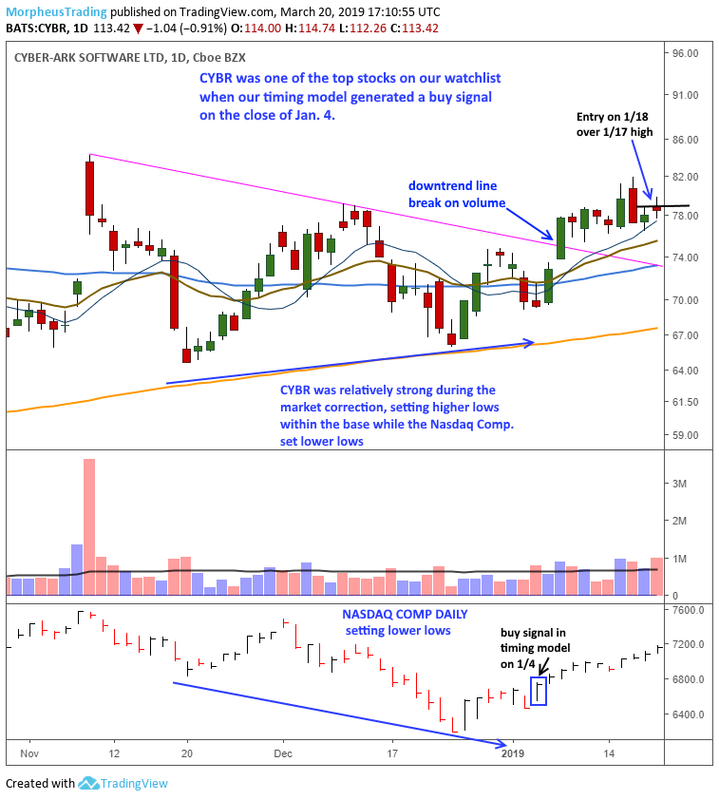 A few days later on Jan. 9, $CYBR cleared the downtrend line of the consolidation on a pick up in volume, which was a buy signal. We patiently waited for a low risk entry point to emerge on a pullback, but the price action just chopped around in a tight range, allowing the 10-day moving average to catch up. On the night of 1/17, we alerted subscribers of The Wagner Daily that we were placing a buy stop over the 1/17 high after the price touched the rising 10-day MA. The buy stop triggered the following day. 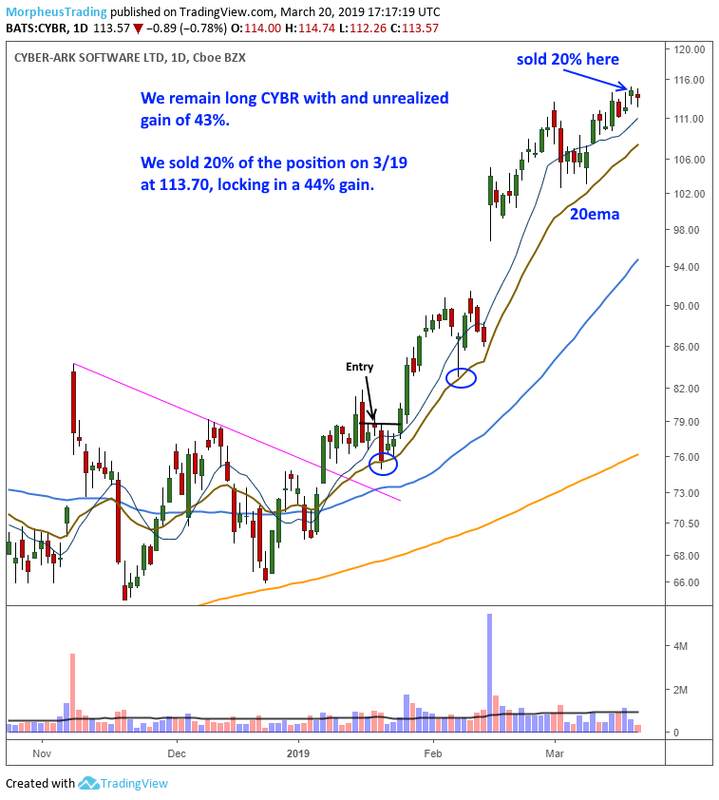 $CYBR failed to move out right away, but found support at the 20-day EMA and produced a low-risk entry on support off of the 20-day EMA on 1/25 and ripped higher. It once again found support at the 20-day EMA on 2/7 heading into earnings. With a profit buffer of 12%, we decided to hold through the 2/13 earnings report, which worked out in our favor as $CYBR closed 20% higher on 2/14. Following the earnings gap up, there was no reason to sell, as $CYBR was acting well and sitting at new all-time highs with no overhead resistance. On the night of 3/17, we alerted subscribers that we would be selling 20% our of position in $CYBR on the next day’s open to lock in a +40% move. Selling partial size allowed us to take some profits off the table while waiting for a true sell signal to exit the rest of the position. As of 3/20, we are still long $CYBR with a +43% unrealized gain. At this point, we are looking for clues from the 10 and 20-day EMA to manage the remainig shares. A heavy volume break of the 20-day EMA would force us to exit most or all of the position as that would increase the odds of the stock going into some sort of multi-week consolidation phase. If you would like to learn more about our style of swing trading, please visit our website or sign up now to receive your real-time trade alerts, hot stock picks, and educational market analysis included with your Wagner Daily subscription.